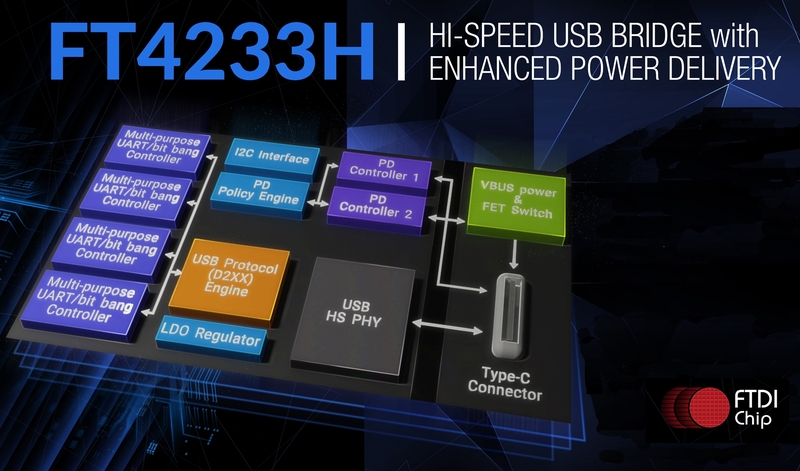 Unveiled at Electronica last autumn, FTDI Chip’s FT4233H USB bridge IC has been designed to unleash the full potential of USB Type-C battery charging. Providing up to 3A of current, this IC is fully compliant with Rev. 3.0 of the USB power delivery standard. Though USB has long been employed as a means of powering computer peripherals and charging smartphone/laptops, Rev. 3.0 takes the protocol to a whole new level, with a broad array of heavy duty power applications being addressed. From now on relatively large items of electronic equipment will be served using it (power tools, lighting, domestic appliances and suchlike), with the capacity available to support up to 100W operation. So far though the USB Type-C IC landscape has been very fragmented – consisting of suppliers that generally concentrate on either the data aspect or the power delivery aspect. What differentiates the FT4233H is that it successfully covers both of these. The incorporation of FT4233H into modern power system designs will add genuine value. The device features two Type-C ports – one of which is configurable (acting as a power source or as a power sink), and another which is always a power sink. If the direction of charge flow is changed (so that the equipment that was being charged subsequently has to charge equipment that it is connected to), then there will be no impact on data transfer activity. It will simply carry on uninterrupted. All the negotiation and power gauging activities are taken care of directly, via the built-in 32-bit PD Policy Engine and USB Protocol Engine elements (with no USB specific firmware programming being required). Consequently, the need for the host MCU to get involved in such functions is eliminated – thus allowing the MCU to remain focused on its core tasks, and thus ensuring that system performance is not effected. Supporting USB High-Speed data rates (480Mbps), the bridging capabilities of the FT4233H include UART, I2C, JTAG, Bit-Bang and SPI. This device draws its power from a single 3.3V source for both VCC and VCCIO. It is supplied in a 76-pin QFN package, with an operational temperature range of -40°C to +85°C being covered.